MATSUYAMA, Japan - A three-run triple from Hiromi Oka broke a scoreless tie in the eighth and Japan rode the outburst to a 4-0 win, evening the series with the USA Baseball Collegiate National Team at a game apiece. Defense was on display as the team's combined to turn six double plays. "Obviously it was a very well pitched game on both ends," commented manager Jim Schlossnagle (TCU). "I thought we had a chance to get to Yamasaki early in the game and he made the pitches to get out of the first inning. From that point forward it was a straight duel between Brandon (Finnegan) and him. Japan played better defense today. Their pitcher pitched a better game and we just didn't get the big hit. It's two very, very good teams. I'm sure most of the games in the series are going to come down to timely hitting." The Collegiate National Team had early chances to take a lead, but stranded five runners in the first two innings. Japan's Sachiya Yamasaki wiggled out the two jams, then settled into a grove as he pitched seven scoreless frames. The defense behind Yamasaki, who issued five walks, turned a trio of double plays. Yasuaki Yamasaki retired all five batters he faced to lock up Japan's win. TCU's Brandon Finnegan went toe-to-toe with Yamasaki, tossing 6 1/3 innings of scoreless baseball. He allowed just four hits, walked three and struck out five. His first real jam came in the fourth inning as he allowed a lead-off single and issued a one out walk. Finnegan got a big strikeout for the second out, then got a soft line drive to second to end the inning. Preston Morrison (TCU) relieved Finnegan in the seventh with two on and one out. He got out of the jam but ran into trouble in the eighth. In his 2 2/3 innings of work. Morrison allowed four runs on four hits. He issued an intentional walk and fanned three. Eight men came to the plate for Japan in the decisive eighth inning as it broke the scoreless with four runs on three hits. Ryo Miki opened the inning with a base hit and was standing on second with one out. 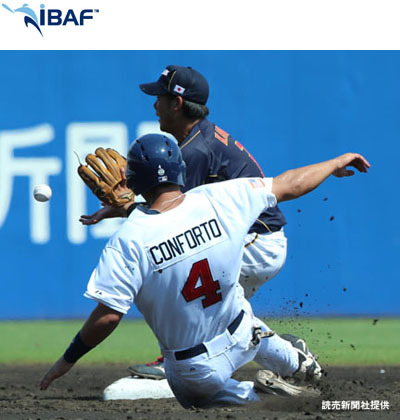 Team USA elected to walk Ryutaro Umeno, but a hit batter followed, loading the bases for Oka. He delivered a bases clearing triple to center for a 3-0 lead. With the infield drawn in, Shoti Okido blooped a single into shallow left to make it a 4-0 contest. Team USA had a golden chance to jump out to an early lead in the first inning. Trea Turner (NC State) led off the frame with a double and was standing on third after a long fly ball out off the bat of Alex Bregman (LSU). A hit batter and a walk loaded the bases for the CNT. Yamasaki got a strikeout and a ground out to end the threat, keeping the game scoreless. Another opportunity presented itself for Team USA as Grayson Greiner (South Carolina) led off the second with a base knock. Austin Cousino (Kentucky) singled with one out to put two on. Both runners were in scoring position with two outs, but Sachiya Yamasaki got a ground ball to end the inning. In the seventh, Japan threatened to break the scoreless tie after a one-out walk to Oka and a base hit by Okido. The base runners prompted a pitching change as Team USA called on Morrison. The right-hander got a ground out for the second out, but on the play both runners advanced 90 feet. A hit batter loaded the bases, but Morrison left them full as he got Yudai Fujioka to strikeout to end the inning. The loss is the first one for Team USA as it boasts a 12-1 overall record this summer. With the series evened up at one, the USA-Japan International Collegiate Friendly Series shifts to Hiroshima on Monday for game three. The two teams will take the field at 5 a.m. (ET)/6 p.m. (JST) at Mazda Zoom-Zoom Stadium.